I'm currently working on two MPC Petty Plymouths, one the Hamilton/BrakeBlok, the other, the Lorenzen STP. (between the headlight covers) needs to be brought forward some? significant inset or if they're closer to flush with the headlight sections. just wondering how far to pull it out- or if at all? Petty's Plymouth used a stock RR grille with blanks over the headlights and screen over the grille between the lights. and they are the ONLY ones I've seen with any significant inset. Back by popular demand. Both 71 and 72 Petty Road Runners use the stock headlight bezel and Hart's parts resin offers a 71 GTX Grill which if you're careful and your hand is steady, you can cut out the grill and headlight surrounds from the petty Roadrunner, use the bezel ends of the GTX grill and the center from the petty Grill. But that still leaves the block off panel under the bumper that should have a matching grill in it. I say find some scale grill screen so they match. Another alternative is use the grill and bumper from the MPC 71 rr reissue,which is 2 separate parts. Same deal,just alot more easy. Do you have any pictures of how you've implemented these suggested solutions, Bobby? So much easier for us less-skilled modelers when images are provided. Thanking you in advance. In fact I do. I am preparing a thread on body work for the MPC 72 Roadrunner including a comparison to the late 80s "reissue". Being since I don't have a photo-sharing set up available to me through my cheap cell phone plan I send and receive my emails and Communications through, both Mark C and Dave Van have both very graciously offered to help me. I'm only waiting on Old-Time Modeler to send me the "reissue" Roadrunner, and he's waiting for the money order! I'm not poor just broke ! LOL! 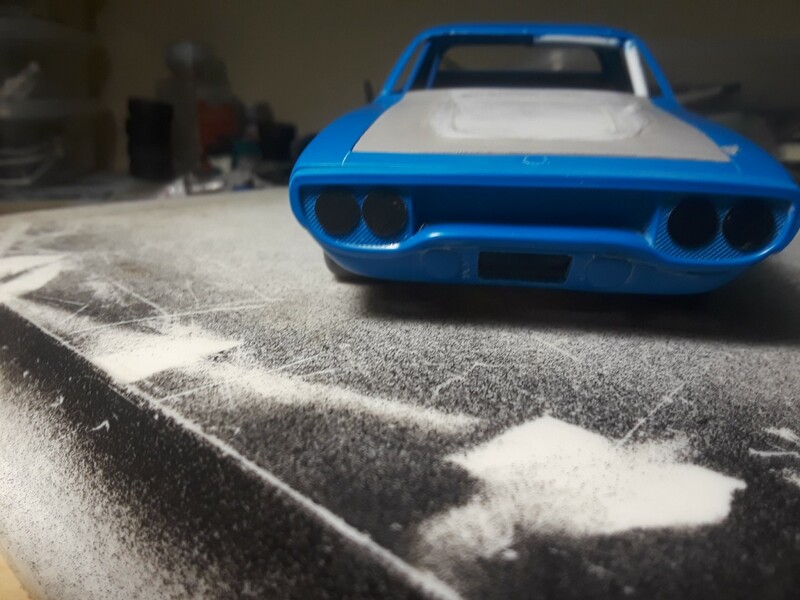 I am also still trying to find the Superbird nose from the "reissue". For those of you who don't know, the reissue and the annual are not the same kit. 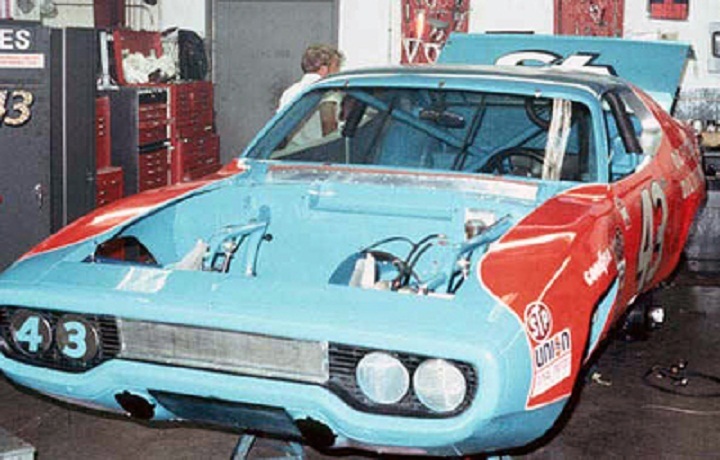 The reissue is actually the Petty Roadrunner tooling converted back to a 71 with an air Grabber Hood, while the Petty Roadrunner was the 72 annual with modified bumpers and hood as well as the fuel filler, door handle covers and window clips added and the marker lights removed. There is something else that is a major change when they modified the body and that is they extended the Rockers under the doors in between the wheel wells to cover the MPC stock car chassis. I have a box stock built up as well, thanks to GuyR1, that I am also going to include in this thread for comparison. Stay tuned! 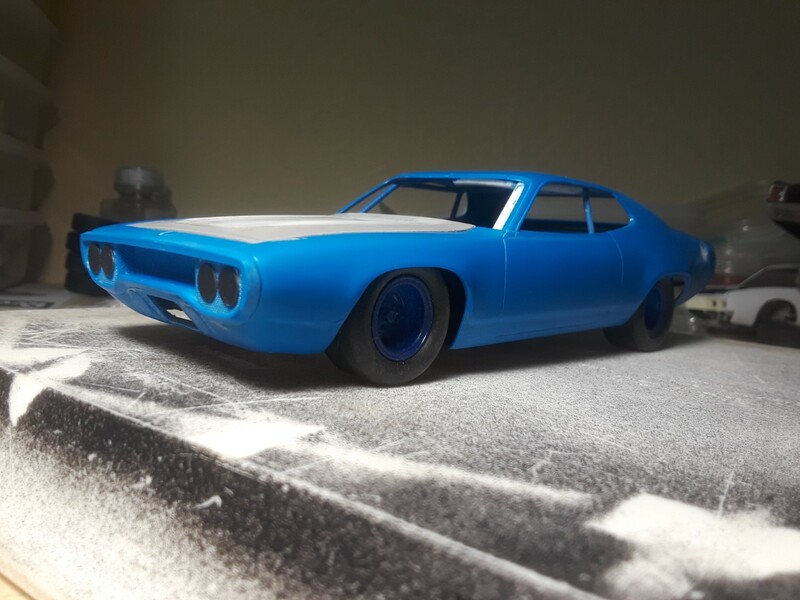 As a favour to Mr. Cabdriver since he is having trouble uploading pics from his phone, here are the pics of his Petty Roadrunner that I uploaded to imgur for him. Thank you mr. C. As you can see I do not have the grill modifications in place yet being since I don't have the parts yet. What I have done is use a standard stationary hole puncher and punched out some circles from 010 sheets styrene. The hood is a Missing Link resin piece and I have had discussions with Kevin because it's a little bit small around the edges and I've had to build it up with again, 010 styrene. 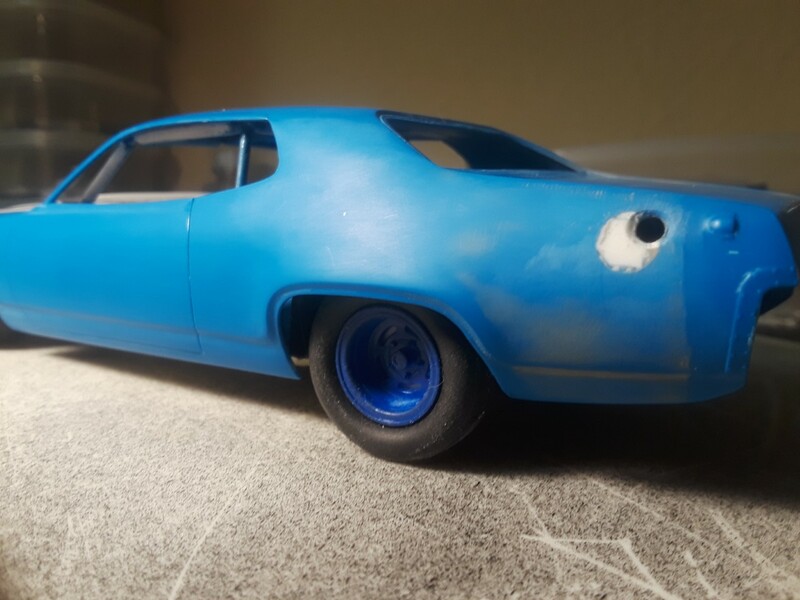 Haven't quite finished the gas filler area but the one on the model is absolutely huge and interferes with both the Plymouth and the STP quarter panel decals no matter what you do. This particular body is a very early one and I don't think I'm going to have the seam problems in the b-pillar I've suffered with some later ones that I believe that John 847 is going through. Also notice that I shortened the rocker panels quite a bit. I didn't measure anything except from the bottom edge of the door down until it looked right and then I did the other side to match. Another thing that I did with this model was I rounded off the edge of the top of the front fender being since there's no real Edge where it goes from vertical to horizontal on these cars. Chrysler called it fuselage styling. I call it beautiful! I've never owned a real one but I've come close and this is one of my favorite Mopars. That's why I have eight models of this body style, 9 if you count the MPC/AMT 74 GTX. And let me get this out of the way right now because I don't want to discuss it any further. The chassis and roll cage is from that Oldsmobile. It fits this body like a glove, like it was designed for one of these cars which I was told it was. It is on the second notch. That looks good. I like how the front wheel wells have been flared and opened up along the top edge, something the Petty crew migrated even further upward as per needs at particular tracks. It's a work in progress, I also kind of like where they sit right now but that doesn't necessarily mean that it's correct. I've got nowhere to go but up! But really, some of the wheel well cuts weren't that pretty. 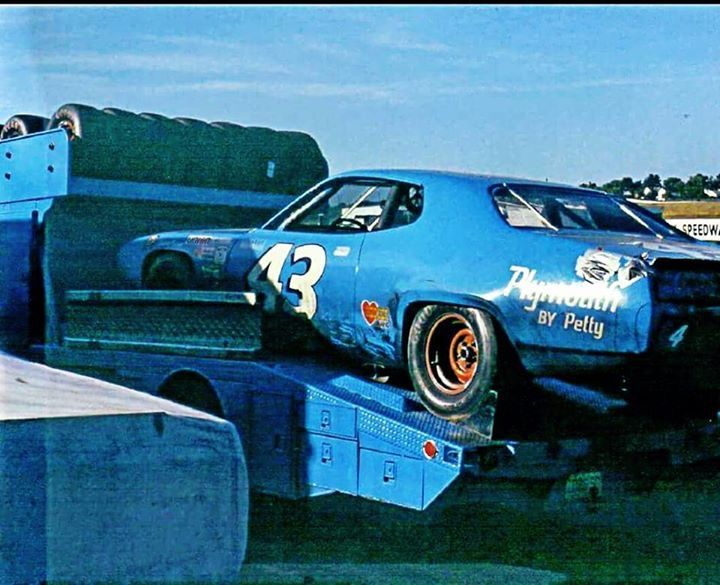 Look at some vintage Petty Plymouth photos and you will see the lower part of the bumper is a lot more forward than the top! The restored Petty cars of today do not have this feature. BEWARE using any of them as reference! The model also does not look like the vintage pics. Sneaky Pettys!! Anything to get more air over the car, instead of under! Yes I am completely with you and I am aware of this, the bumper is only taped in for display and I'm waiting for a late 80s 71 Roadrunner so I can get the separate Grill. These pictures should probably be in WIP. I can't proceed any further because I don't know if I'm going to use the bumper from that kit as well. Something I'm considering doing is having the 71 bumpers, front and rear as well as the grill, resin cast if there's any interest. I've also cut up a monogram 71 satellite rear bumper, but I'm not really feeling it's going to work..
Wow, it took all the way to the end of the second duel but somebody was actually able to make a clean pass! GOOD point! Emphasizes what I said about the museum cars. I recently noticed the same thing on the Monte carlo. the way that car's bumper was set, had somebody stopped quick in front of him, he'd have driven right under them. 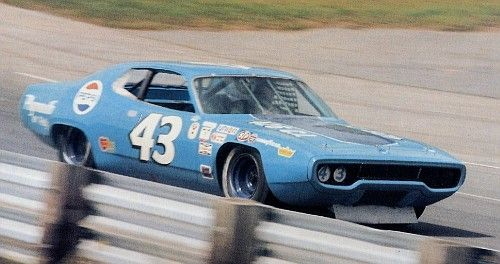 It is somewhat well-known that they cut original roll bar tubing on the front clip of the car they thought was Hamilton's Nichols chassis Daytona winner but was actually Richard's Superbird to match the in House built and cheated up short track Road Runner that's been masquerading as a Superbird for many years. Ugh. There is also a somewhat famous picture of a smiling Richard kneeling next to a 72 Roadrunner where the nose is so dropped you have to wonder whether or not it was photoshopped, is anybody aware of the picture I'm talking about? And is it photoshopped or did they really have the nose drop that far down? Now there's something I hadn't noticed but now when I look at the vintage pics I can't help but notice! Thanks, stuff like this is what makes this board a great source of information. Bobby, which version of the '72 are you building? 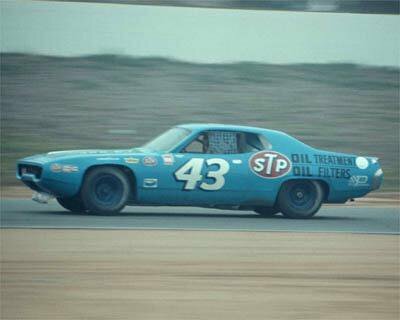 The earlier car with just the STP oval on it, or the Granitelli-ized version with all that Day-Glo red on it? 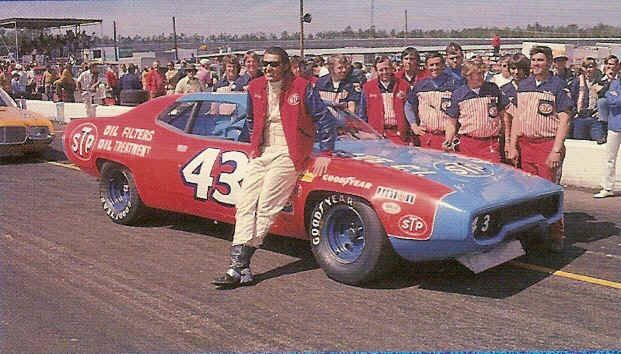 Actually, the first one I'm going to do is going to be the 71 Daytona 500 winner, I would like the second one to have the funk graphics on the hood. I'm not that good of a painter so I'm probably just going to go with the dark blue insert and the rounded break in the graphics on the fenders. I have talked to Mike about a decal for the funk graphics( that's the one with the rounded Corner squares throughout the blue insert )and it's a maybe someday thing right now. I guess you could say I'm looking at a mid-year car where they was still cutting the red out of the STP decals and solid blue Hood insert. 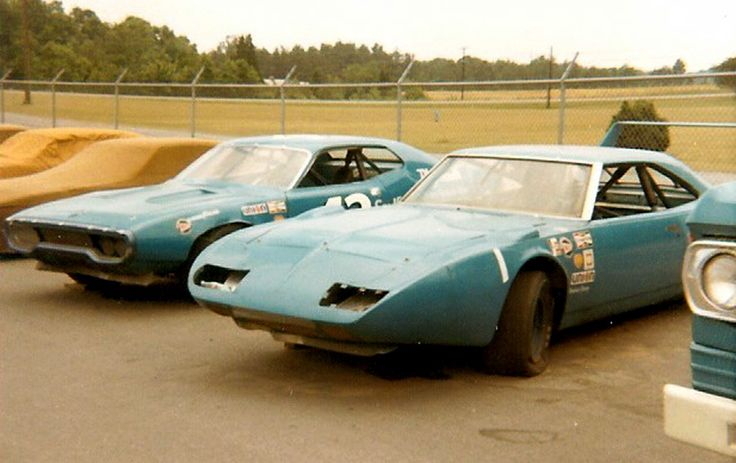 There's a couple of humorous stories attached to that 71 that you have pictured next to the Superbird. There was some great stuff about that car on the old forum. As far as I know, that's the last car that was not built in house. I think Greg knows some good stories about it. Yeah, I wish the old forum had been backed up as a lot of good stuff was lost in the reset. But, that's all water under the bridge now. Maybe it's just my imagination, but I thought somebody had done the 'funk' graphics years ago... I wouldn't rely on my memory though, as it can be somewhat faulty at times. Just as an FYI, the old site WAS backed up. Multiple attempts by Bob Hanner to restore those backups failed. It appears the software used to create the backups produced corrupted data which subsequently could not be recovered. I was trading emails with Bob during the many recovery attempts and he spent well over a week working on it.....obviously without any luck. He was as sick about the lost data as anyone......it sadly can't be helped. So I guess it really is up to us to work on restoring this forum to where it used to be. Or at least trying to get close. I'm doing my part. Thanks Dennis. I had no idea on what was going on behind the scenes, only the end result, unfortunately. It's a huge loss, but the only choice we have is to move forward. Would be nice of some of the old crew could come back and bestow their info on us again, but I realize some of them are not even with us anymore. The one photo posted above, with the Runner next to the Woodward Garage SuperBird, was the early mule car that was stock appearing. That's exactly the picture I was talking about! That nose is so down it looks photoshopped! Who says the Petty's didn't get a break from Nascar? I guess they never saw this picture did they! Greg, you know the story of "curious blue", can you shed some light on it? Not just the name, but the Martinsville tests as well. Please Uncle Greg tell us a story!!!! Please!!! They were at Martinsville doing disc brake testing. Ran a 426 wedge in the Nichels built Plymouth. Man!!! That's one cheated up nose on that Speed Chicken!!! 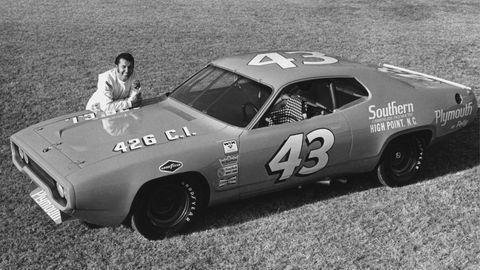 The '72 Roadrunner was much more tricked up than the '71 (apparently winning 21 races and the Championship in '71 left them wanting more). Buford Wilburn mastered a body that represented that extended, droop-nose car for SMH to cast but unfortunately the caster sort of butchered the body by attaching the valence to the nose backwards. I have one or two of them that I need to build, not sure if Ronnie still offers it. THAT is one tough Bird!!!! I really did think it was photoshopped! Could this be one of the most radical cars to hit the track in those "adjustable" template days?